We are pleased to announce that we are SOLD OUT of Vendor spots and Sponsorships! Thank you to all that have registered for the day. We look forward to another exciting Matawan Day! 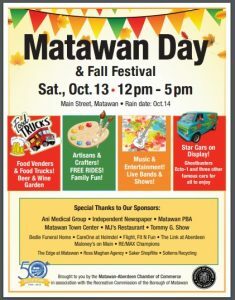 Matawan Day 2018 is scheduled for Saturday 10/13 with a rain date of Sunday 10/14, 12:00 pm – 5: 00 pm. Matawan Day is an annual event in which thousands of people make their way down Main Street to visit the over 120 booths and tables of crafters/artisans, retailers, food vendors, local restaurants, professionals, and non-profit organizations who were ready to showcase their products, and services. It is a great way to get your business out in front of such a large audience in the course of 5 hours! If you have any questions, feel free to contact our office at 732-290-1125. We would be more than happy to assist you.